Make your own way downtown to meet your bus for a narrated sightseeing tour of Houston. During the 75-minute tour by double-decker open-top bus, pass by City Hall, Minute Maid Park (home of the Houston Astros baseball team), Market square,Sam Houston Park, Houston’s Historic District and much more. Afterward, transfer to a comfortable bus that takes you to Space Center Houston and NASA’s Johnson Space Center. Although high-profile space flights launch from the Kennedy Space Center in Florida, most of the planning and training for the US space program takes place in Houston. 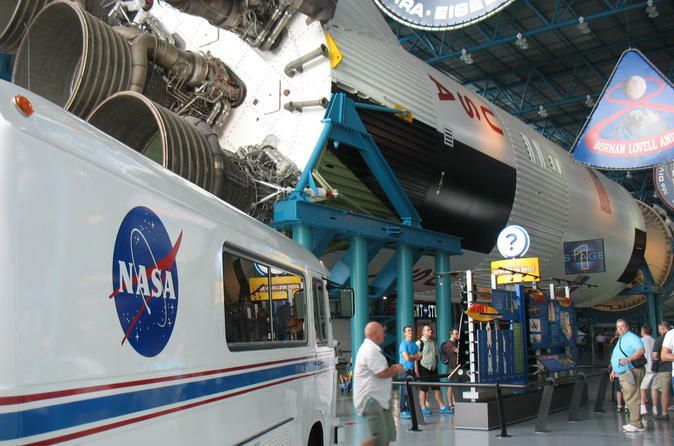 After the tram tour, have free time to explore the exhibits at Space Center Houston, NASA's official visitor center. Astronaut Gallery features the world’s most comprehensive collection of spacesuits. Check out Apollo 17, the last manned spacecraft to fly to the moon. Experience what it’s like to be on the Space Shuttle at the interactive Living In Space gallery and take a close look at a full-size replica of the Space Shuttle. At the designated time, meet your bus for the return trip to downtown Houston ( Visitor center ) where your tour ends.